No one is happy about missing their bus – but if young Thomas Daniel had successfully made it onto his school bus last week, he would have never met Officer Lynema. Lynema, who is with the Grand Rapids Police Department in Michigan, says that he saw the 9-year-old boy chasing after a school bus early in the morning. Lynema asked Thomas if he wanted a ride to school, which the youngster gratefully accepted (with his mom’s permission). On the way to school, Thomas invited Lynema to his birthday party that evening. The boy also said that he was worried none of his classmates would show up for the party because he is often bullied in school. When Lynema attended the party later in the day, he was heartbroken to discover that he and Thomas’s siblings were the only people who had shown up for the party – and the youngster didn’t even have a cake. 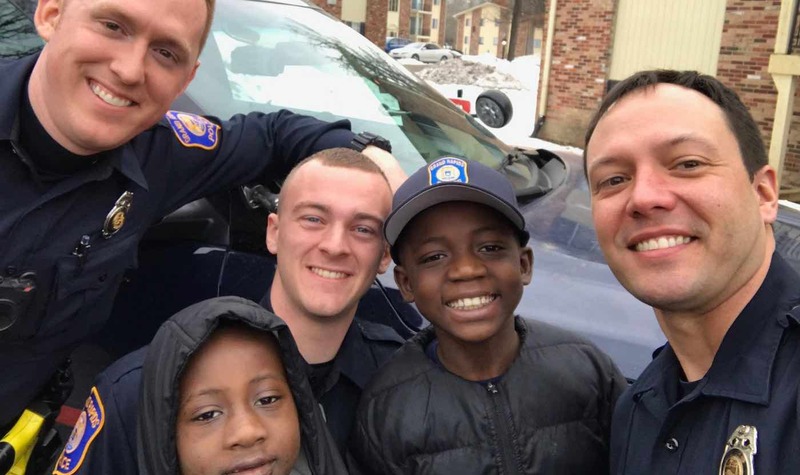 The next day, Lynema rallied his fellow police officers and returned to Thomas’s house to throw him a second birthday party. After Thomas got back from school, he was shocked to come home and find presents, a Krispy Kreme donut cake, and a singing quartet waiting to surprise him – all courtesy of Lynema and his colleagues. The police department posted photos of the youngster and his new friends in hopes that it would inspire other people to take action against bullying. This brought tears to my eyes. How sad that kids don’t show up for a birthday party! And how wonderful that the police gave him a second party. My cousin lives in Grand Rapids and she always says what a great place it is and this proves it.